KODIAK, Alaska -- Leaving a wake of fire and smoke twisting above the jagged Alaska coastline, a Minotaur rocket fired away from a remote launch pad Tuesday and released a U.S. Navy satellite in orbit give military forces better communications links on the battlefield. The Minotaur 4 rocket blasted off from Kodiak Launch Complex in Alaska at 1549 GMT (11:49 a.m. EDT; 7:49 a.m. Alaska time) Tuesday and rapidly soared into space on the power of retired stages from the Peacekeeper missile. A solid-fueled fourth stage injected the payload into orbit, then the spacecraft used its own thrusters to reach its operational position in space about two-and-a-half hours after launch. "The launch went well," said Lou Amorosi, senior vice president for the Minotaur rocket at Orbital Sciences Corp. "Looking at the data, it looks like everything went nominal. We met all of our insertion requirements. The deployment rates when we deployed the satellite were all well within our expecations. Everyone seems to be very happy." 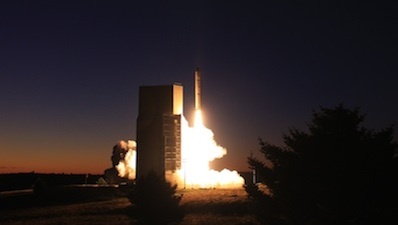 It was the sixth launch in about a year for the Minotaur rocket family, which recycles components from decommissioned Minuteman and Peacekeeper nuclear missiles to propel satellites into space. "I'm very proud of the team and the dedication the team's had," Amorosi said. "Just in the last 12 months, we've had six missions from three different launch sites." The 1,000-pound satellite is flying in a unique, gravitationally-stable orbit ranging from 400 miles high to more than 7,300 miles in altitude. From that orbit, the craft's UHF communications package will connect military units via radio. 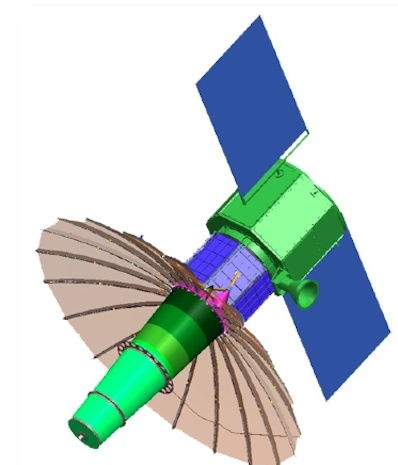 Named TacSat 4, the satellite was developed under the auspices of the military's Operationally Responsive Space office, which was chartered to investigate and fly less costly niche missions designed to serve tactical needs. TacSat 4 flies three times closer to Earth than traditional military communications satellites, meaning users on the ground have nine times the signal strength compared to legacy systems in higher orbits. "You're using basically a glorified walkie-talkie to talk anywhere inside of the satellite's field of view, and that's just a huge game-changer," said Peter Wegner, director of the ORS office. And unlike those more advanced spacecraft, which sometimes cost more than $1 billion, TacSat 4 was built and launched for $118 million, according to the Air Force. "Our job is to really explore the capabilities that we can bring to the fight with smaller, lower-cost systems like this," Wegner said. "One of the things TacSat 4 can do is really augment that communication capability around the world." The TacSat 4 mission is managed by the Naval Research Laboratory. 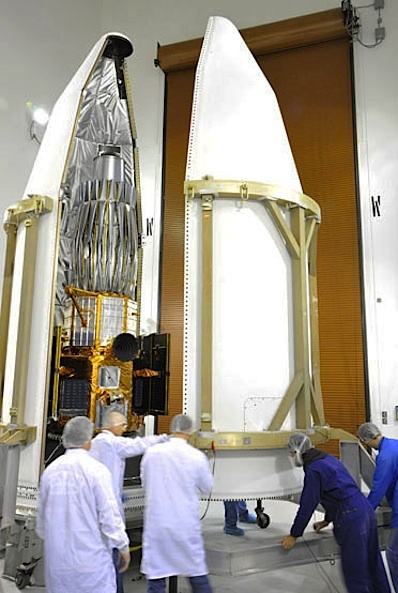 It is the lab's 100th satellite. "TacSat 4 supports a critical warfighting requirement: communication," said Rear Adm. Nevin Carr, chief of naval research. "We've developed a technology that will supplement traditional satellites, giving military personnel on the ground another outlet for data transmission and facilitating 'comms on the move.'" Mike Hurley, head of spacecraft development at NRL, said TacSat 4's orbit allows it to fly higher in the sky in battle zones like Afghanistan for up to two hours at a time. Lower altitude satellites are in view for less than 10 minutes a few times a day, while existing geosynchronous communications spacecraft are near the horizon and blocked by rugged mountain ranges. "This is a higher orbit, which Kodiak allows and ORS enhanced the Minotaur 4 so we could get a little higher," Hurley said. "Between those two, then if you're in a mountain valley, the satellite is coming up quite a bit higher versus being down on the horizon." Soldiers today must find a clearing with some elevation to reach satellites orbiting over the equator, often putting them in harm's way. "Imagine you're deployed in Afghanistan in some mountain valley trying to get communications, and there's Taliban all around, you have to climb up on a mountain ridge, point that thing at a GEO satellite and sit there and talk," Wegner said. Liftoff occurred at 1549 GMT (11:49 a.m. EDT; 7:49 a.m. Alaska time) from Kodiak Launch Complex, Alaska. Credit: William Hartenstein/Orbital Sciences Corp. Although TacSat 4 will only provide limited coverage, a fleet of four satellites could provide constant communications over a specific region like the Middle East or Afghanistan. TacSat 4 is considered an experiment, but the military plans to transition the satellite into normal military operations in about one year. Military officials say such a multi-satellite constellation, if deployed, will save lives. "One of the first medal of honor winners was Lt. Mike Murphy, who was a SEAL team member," Wegner said. "He and his SEAL team were pinned down by insurgents, he hiked up on this ridge to call for support and was mortally wounded doing it."